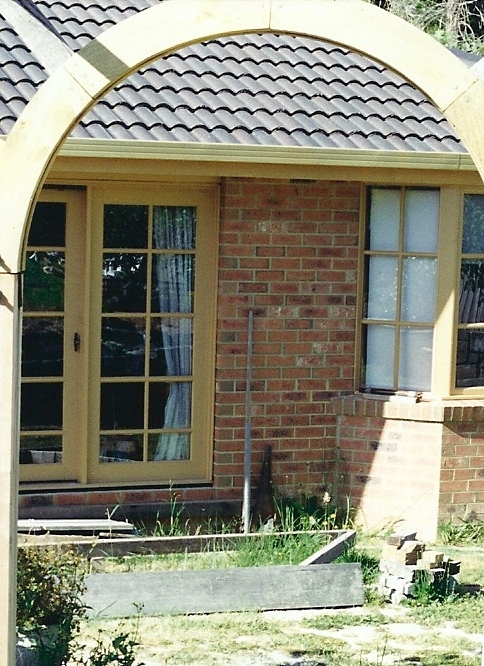 After the extension was built in 1991, again we had to wait and save money to finish things off. 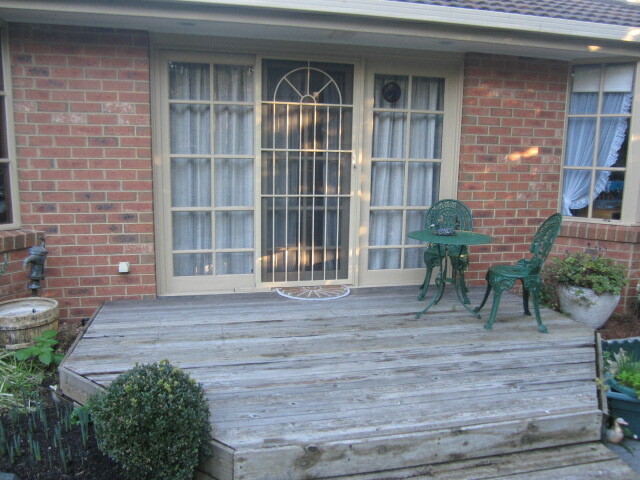 In the meantime, we put bricks and planks at the back colonial sliding door to step down to the back yard. We had plenty of time to plan what we might do to the area. 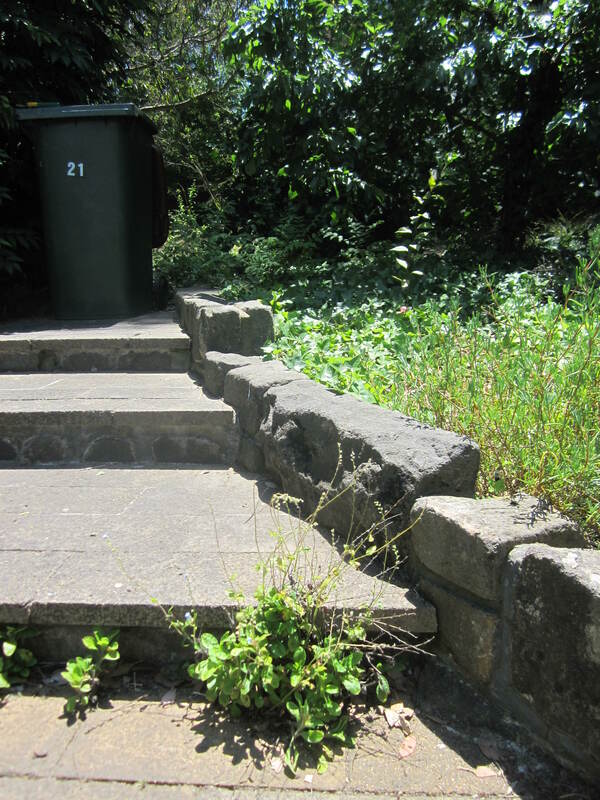 Rather than just a couple of steps, we decided to make it a reasonably sized decked area, which we refer to as “the stage”, because the bluestone-edged steps opposite are reminiscent of tiered seating. I also used to harbour dreams of becoming a famous actress, so the idea of my own personal stage was very appealing. 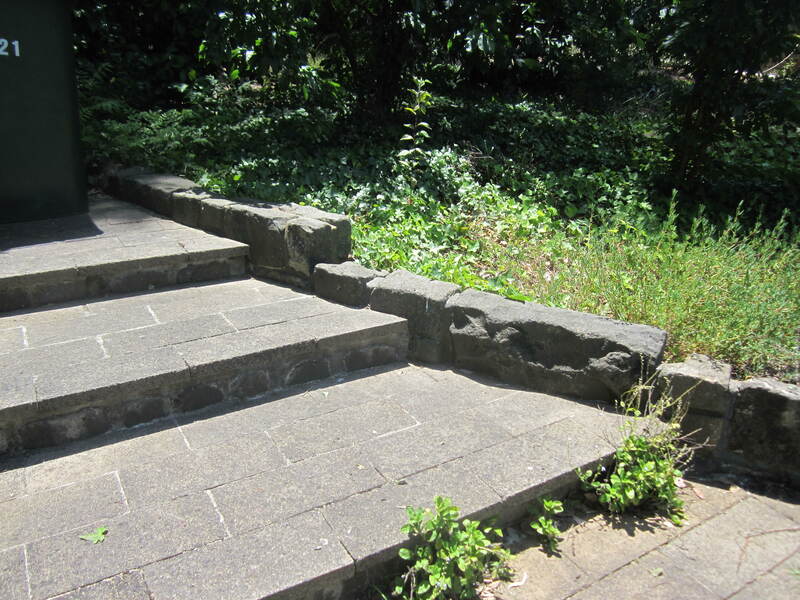 The bluestone steps were still to be constructed at this stage. Every now and then we need to replace the slats, as we opted for the natural weathered grey look, which ties in nicely with the bluestones featured in our back yard. A little time travel back to the 90’s leads us up a flight of steps. 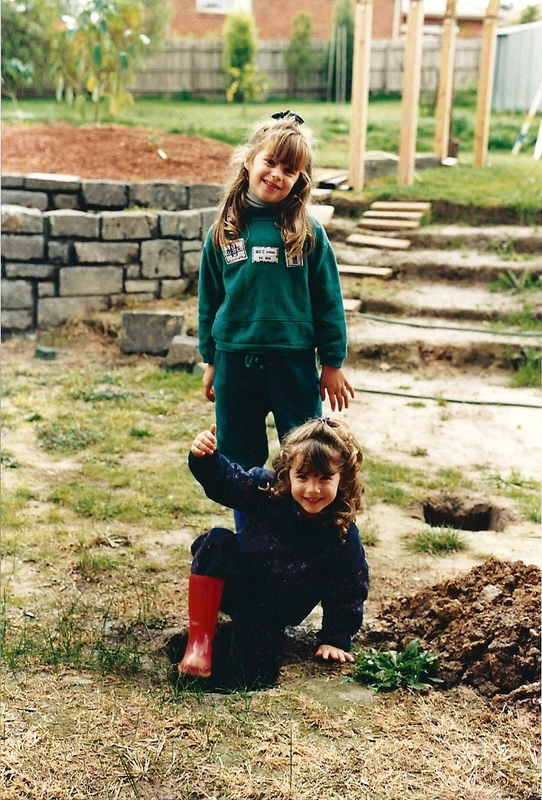 Next to the first bluestone wall we had dug out some wide steps leading up to the second level in the back yard. 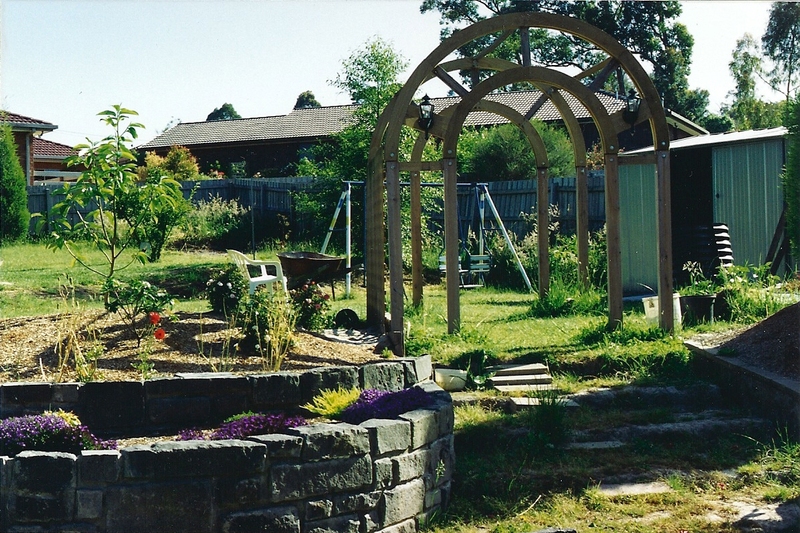 As with most jobs in our garden, we had to wait until we could afford this project, which was completed by Christmas 1993. Sometimes I look out at the garden and feel slightly overwhelmed, as there is always a lot to do, but then I remind myself to tackle it bit by bit. Remember how to eat an elephant? – one bite at a time. 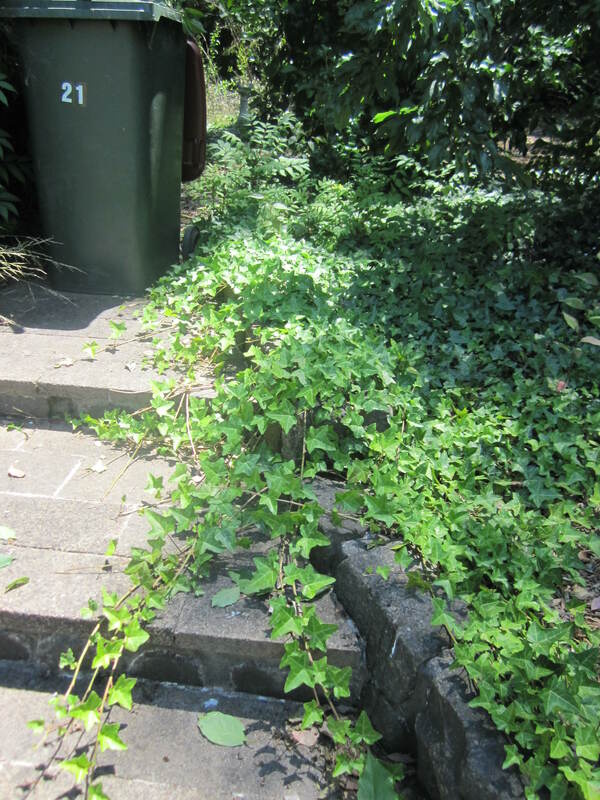 Long ago we planted a little cutting of ivy as a ground cover and of course it has taken over in some areas. However, nice greenery is provided by this ivy, so I am keeping it. Just like giving our kids boundaries, so too must we limit where ivy can grow. We don’t want obnoxious, spoiled children, or excessive ivy. I remember many years ago thinking it would be lovely to buy an established house with an overgrown garden in which you could make wonderful discoveries, and now here I am in my own garden uncovering personally-designed treasures! 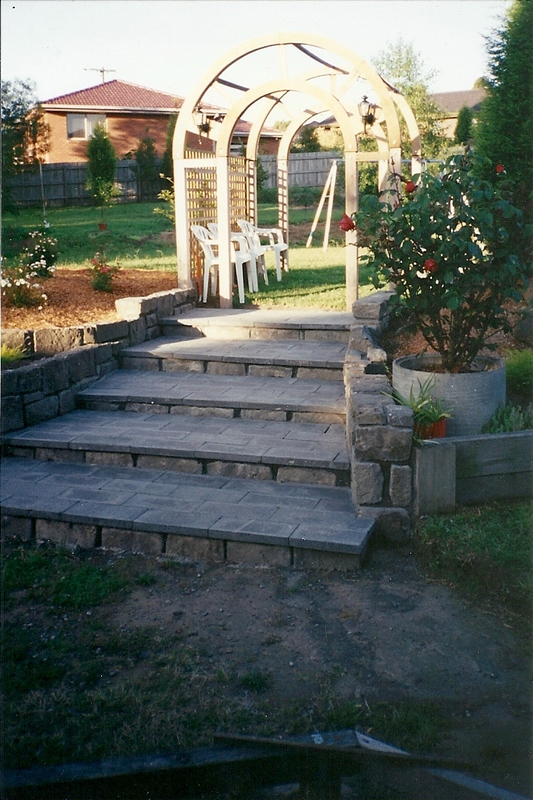 In this case, the upper steps with bluestone edging look quite striking when they are neatened up, and provide a grand entrance to the top tier.